New York Police Commissioner Bill Bratton, New York Mayor Bill de Blasio and the Rev. Al Sharpton meet at City Hall July 31, 2014, for a roundtable discussion about police-community relations in the days following the apparent choke hold death of Eric Garner while in New York police custody. As New York City continues to grapple with Staten Island dad Eric Garner’s death, which led an incensed city to demand justice, Mayor Bill de Blasio held a roundtable discussion with the Rev. Al Sharpton and Police Commissioner Bill Bratton to talk through the next step to be taken toward healing the community, the New York Daily News reports. De Blasio, with Sharpton on his left and Bratton on his right, addressed the growing ire and concerns of the community following the Garner incident. Bratton, the news site notes, is hoping to propose retraining for all NYPD officers, especially the 20,000 cops who mainly work the streets. “Training is absolutely the essential catalyst for, out of this tragedy, finding opportunity,” he said, according to the Daily News. “I take Rev. 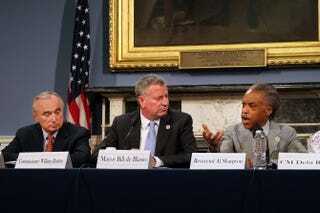 Sharpton’s admonition to heart—the time is now,” de Blasio said in response, according to the Daily News. However, he pointed out that “the work of reform takes real intensity, real effort … and some real patience.